Get your motor running, and get out on the highway, it's time to start racing! Click here to play! 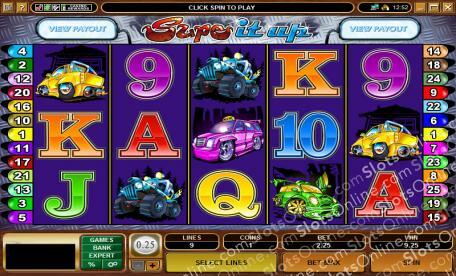 If you are in the mood for big engines, big cars, and even bigger cash payouts, then this is the slot for you. Supe It Up is a thrilling 5-reel slot played across 25 pay lines, where the more lines activated means more chances of winning combinations. The Wild Nitrous logo can be substituted for any other symbol on the reels except Scatters, and can earn you a nifty payout of up to 10,000 times your initial wager. Whenever you win on the reels you will be given the chance to Gamble your winnings and play for double or quadruple your cash! Scatters can appear anywhere on the reels and will also win you up to 30 free spins when three or more show up after a spin. The engine it running hot; it's time to play Supe It Up today! The Woofer is Scattered and can earn you up to 600 times your bet. If you manage three or more on the reels you can also win up to 30 free spins. The Wild Nitrous symbol can be substituted for any other icon, except Scatter, in winning combinations. If you manage all five on active pay lines you will be rewarded with up to 10,000 times your initial stake.